To speke of phisik and surgerye, . . . So Geoffrey Chaucer wrote in his prologue to the Canterbury Tales, naming the great physicians of the past that his 14th-century audience could be expected to recognize. In the list are four Greek figures: Asclepius, the focus of a Greek healing cult; Hippocrates, or 'Ypocras' as Chaucer called him, a 5th to 4th-century BC physician whose name is associated with a fundamental collection of medical writings; Rufus of Ephesus in Asia Minor, a physician of the 1st century AD who composed over 60 Greek medical treatises; Dioscorides, whose treatise on medicinal substances written about 77 AD formed the basis of pharmaceutics for centuries; and, of course, Galen of the 2nd century, arguably the most influential figure in the history of medicine. The writings of all but the first of these Greek figures were known in the Arabic-speaking world and provided the early foundations of the medical art in the Islamic world. Chaucer then goes on to name physicians from the medieval Islamic world: Ibn Sarabiyun or Serapion as he was known to Europe, a Syriac physician of the 9th century; 'Razis' the great clinician of the early 10th century; and `Avicen', or Avicenna as other Europeans called him, referring to Ibn Sina whose early 11th-century medical encyclopedia was as important in Europe as it was in the Middle East. Just as early Greek medical teaching served as a common intellectual framework for professional medical practice in the Islamic Near East, so Arabic medical literature of the 9th to 12th centuries, through Latin translations, provided late medieval Europe with ideas and practices from which early modern medicine eventually arose. The earlier Greek medical teachings were welcomed and valued by an emerging Islamic empire which needed to find ways of dealing with medical problems common to all peoples: disease, pain, injuries, and successful childbearing. This heritage of medical theory and practice, mingled with some Persian, Indian, and Arab elements, was assimilated and elaborated by a community of both Muslim and non-Muslim physicians speaking many languages -- Arabic, Persian, Syriac, Hebrew, and Turkish, though Arabic became the lingua franca and Islam the dominant faith. From Spain and North Africa through the central lands of Egypt, Syria and Iraq, to Iran and India in the East, and over a period of roughly twelve centuries (from the middle of the 8th to the present century), Islamic medicine has shown great variation and diversity. As cosmopolitan Islamic culture developed, shared traditions spanned vast areas and crossed many centuries. Yet wound round the common threads were innumerable other factors and local conditions that produced considerable diversity. Communications over such a vast area during the course of several centuries were, as would be expected, neither uniform nor very swift, and the dispersion of ideas and texts from one region to another was uneven. The institutions and policies responsible for dispensing medical care were subject to political and social fluctuations. The general health of the Islamic community was influenced by many factors: the dietary and fasting laws and the general rules for hygiene and burial of the different religious communities of Muslims, Jews, Christians, Zoroastrians, and others; the climatic conditions of the desert, marsh, mountain and littoral communities; the different living conditions of nomadic, rural, and urban populations; local economic factors and agricultural successes or failures; population migration as well as travel undertaken for commerce, for attendance at courts, or as a pilgrimage; the injuries and diseases attendant upon army camps and battles; and the incidence of plague and other epidemics as well as the occurrence of endemic conditions such as trachoma and other eye diseases. Woman, with attendant, reviving an elderly man. Ink drawing, highlighted with gilt and watercolors, signed by an artist Shaykh Muhammad. One of several illustrations accompanying anonymous poetry following a Persian text on sexual hygiene. Undated. 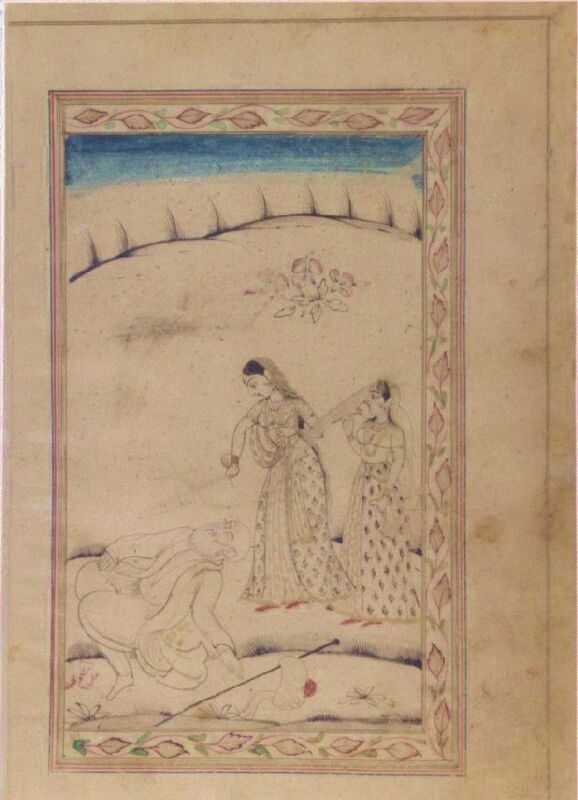 Possibly 18th century India, possibly Kashmir. Medical care is, in addition, always multifaceted, with the needs of the society being served by various local traditional practices as well as the formal learned medicine. The sophisticated learned Islamic medical texts that are the focus of this exhibition represent only one facet of the actual medical care of the society. The medical practice of the society varied, not only according to time and place, but at the various strata comprising the society. The economic and social level of the patient determined to a large extent the type of care sought, and the expectations of the patients varied as did the approaches of the medical practitioners. The medical care in the medieval Islamic lands involved a rich mixture of religions and cultures to be seen in both the physicians and the patients -- a coexistence and blending of traditions probably unrivaled in contemporaneous societies. The medical profession in general transcended the barriers of religion, language, and country.